When we consume foods and meals there are three key nutrients that contribute to our energy or kilojoule intake - carbohydrates, proteins and fats. Different foods and food combinations offer different proportions of these macronutrients. A banana for example is primarily carbohydrate based whereas a mixed meal of a steak, potato and vegetables contains protein, carbs as well as fats found in the steak. As such, which foods we choose each day determines our overall intake of carbs, proteins and fats. Diets can range from high carb as consumed when we based our diet around breads, cereals, rice, pasta, fruits, starchy vegetables and sugars to high protein diets which focus more on meats, fish, eggs and dairy or even high fat diets which utilise a high proportion of oils, nuts, seeds and proteins that contain fat such as oily fish, meats and full cream dairy at the expense of carbs. Carbohydrates are primarily found in plant based foods including bread, rice, breakfast cereal, fruits, starchy vegetables and sugars and offer 17kJ of energy per gram. The simplest form of carbohydrate is glucose and carbohydrates range from mixes of simple sugars to hundreds of individual sugars which form more complex carbohydrates such as breads and cereals. Carbohydrates can also be grouped according to their glycaemic index. The glycaemic index refers to how quickly or how slowly a carbohydrate releases glucose into the bloodstream. Carbohydrate based foods that release glucose more slowly into the blood stream such as legumes, wholegrain bread and stone fruit are low GI foods compared to white bread, rice and tropical fruits which release the glucose they contain relatively quickly into the blood stream and are called high GI foods. Traditionally it was recommended that active individuals primarily base their intake around carbohydrate rich foods simply because carbohydrates are the primary fuel for the muscle. As such, the more active an individual, the greater the amount of carbohydrate they will require to adequately fuel the muscle. Modern thinking has changed in this view slightly as while individuals may be relatively active for some parts of the day, many of us also spend many hours sitting, which means our carbohydrate requirements are significantly reduced. How much carbohydrate do I require? There is not just one rule when it comes to determining how much carbohydrate each athlete will require. It will change daily depending on training load, weight loss goals, movement and dietary preference. In fact, evidence based recommendations for daily carbohydrate intake range from as little as 3-5g per kilogram of body weight or 240-400g of total carbohydrate per day for an individual exercising regularly to 10-12g per kg for elite athletes training for 4-5 hours each day. In real life things are often very different and the average recreational athlete tends to report intakes of 200-300g of total carbs. When working with clients, rather than provide a set prescription of carbs to be consumed I instead start with an assessment of how much my client is already consuming, identify what their goals are for example increased energy or fat loss and then adjust the total amount of carbohydrates they are consuming based on these goals. 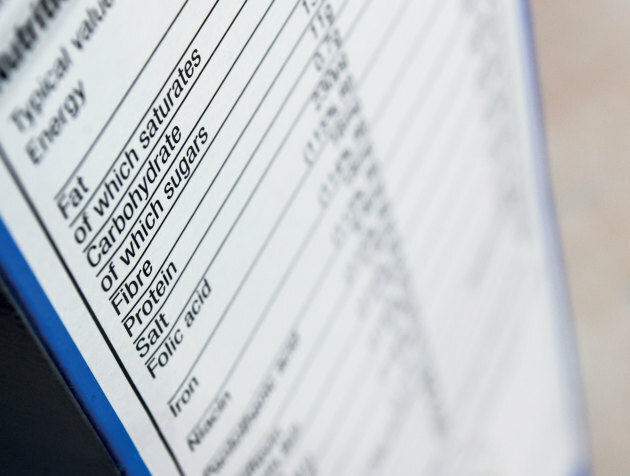 Another option is to count the amount of carbohydrate being consumed at each meal and snack. 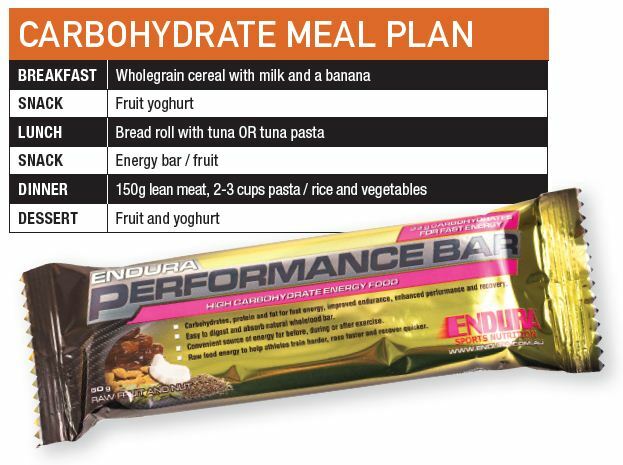 For active individuals, aiming for at least 20-30g of total carbohydrate at each meal and snack, especially pre and post training sessions will help to ensure your muscles always have a readily available supply of carbohydrate to fuel the muscle and aid in recovery post training. On the other end of the spectrum, if fat loss is the goal, reducing carbohydrate intake at the time of training is the worst thing you can do, as the active muscle requires a certain amount of carbohydrate to burn body fat. Rather slightly reducing your total carbohydrate intake from its baseline including a taper in which you consume more carbs in the first half of the day is the key to success. To determine how much carbohydrate you are consuming, simply download an online application such as ‘myfitnesspal’ which can calculate the total amount of carbohydrate quickly and easily. Protein is primarily found in animal based foods including meats, fish, dairy and eggs and in smaller amounts in some wholegrains and legumes and offers 17kJ per gram. Proteins are made from individual amino acids which combine together. Animal foods contain the full range of amino acids, which are easily used by the body while plant sources of protein including wheat and beans, contain some but not all of the amino acids, and hence need to be eaten in mixed varieties for the body to get all the complete protein it needs. Proteins unlike carbohydrate primarily have a functional role in the body, building muscle and connective tissue, playing a key role in immune functioning and a number of other important roles in regulating metabolism. As a basic requirement, adults require just 0.75g-1g of protein per kilogram of body weight, or 75-120 grams of protein each day for the average male. Since a small chicken breast contains almost 30g of protein, it means that the average Australian gets more than enough protein in their diet. Naturally active individuals require more protein than sedentary people but still it is not difficult to get the amount of protein you need from your basic diet. And contrary to popular opinion, more is not better. In fact, excessive amounts of protein will simply be excreted via the kidneys. For cyclists this means that aiming to include one protein rich food at each meal or snack will mean you reach a minimum of 75-120g of protein per day or 15-20% of total calorie intake. 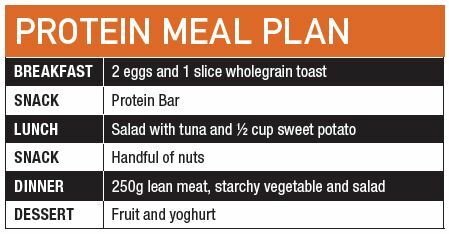 If your goal is fat loss or to simply keep your carb intake low you could increase the % of protein to 30% of total calorie intake simply buy increasing your serving sizes of meat, fish and dairy during the day. While there is much hype about higher fat diets for athletes, for most of us rather than forming the basis of a dietary approach, fat has a functional and relatively stable role in the diet. Once you have ticked the box for your carbohydrate and protein requirements, the average active adult will require just 60-100g of total fat each day or 25-30% of total calorie intake. More than this, unless part of a specially formulated high fat dietary approach, will be stored, while less (than 60-100g) will potentially compromise the production of hormones, cell health, immune function and vitamin transport around the body. Fat can be broken down into two main types, saturated fat and unsaturated fat. 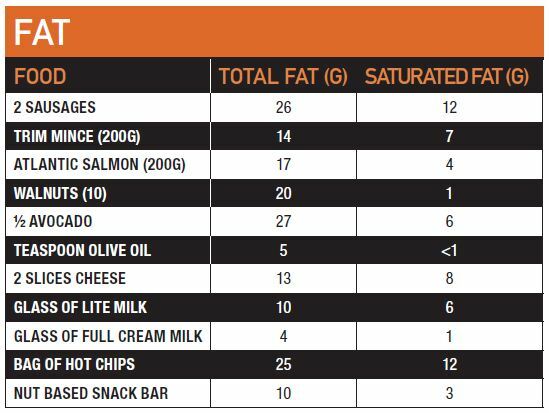 Saturated fat is found predominately in animal based foods including meat and full fat dairy as well as processed foods such as including a number of biscuits, cakes, pastries and fried takeaway food. We require minimal saturated fat in the diet. On the other hand unsaturated fat, which includes monounsaturated and polyunsaturated fat found predominately in plant based foods including oils, nuts, seeds and avocados plays an important role in the body as a natural anti-inflammatory, and a key component of cell health. 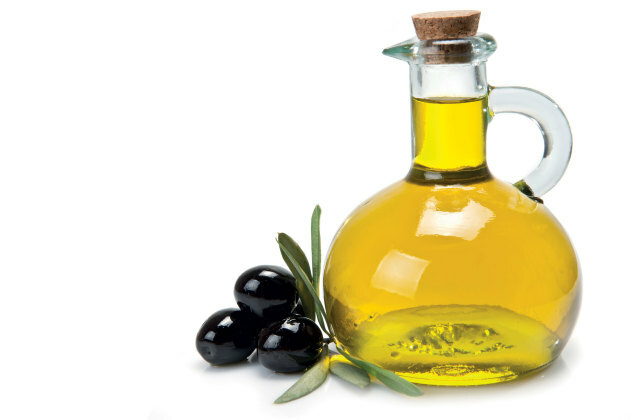 Ideally we need a 1:1:1 ratio between polyunsaturated, monounsaturated and saturated fats. 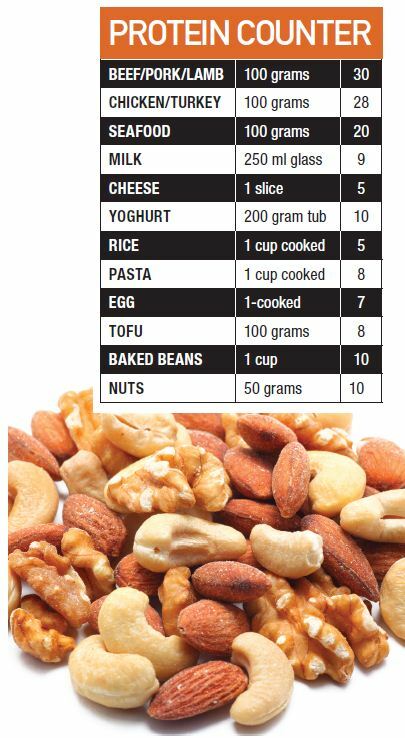 This is easy to achieve via a serve of nuts, oily fish, a couple of tablespoons of olive oil and ¼ avocado along with minimal added fat from fried, processed and take away foods.